For Abeking & Rasmussen, the famous German shipbuilders, hull number 6478 represents the attainment of an important record. Indeed with its 78.43 metres in length and a beam of 12.40 metres the new motor yacht is the largest boat ever to leave the shipyard overlooking the Weser River near Bremen. 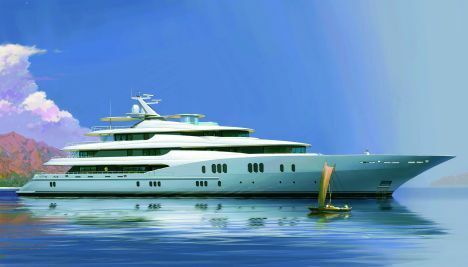 Designed in conjunction with Reymond & Langton Design, the new motor yacht developed over five decks with a steel hull and superstructure entirely built in aluminium, is destined for long voyages. To this very end, the project designers briskly worked to obtain efficient hull lines giving lower consumption figures and a greater range, whilst limiting the draught to 3.20 metres to allow the yacht to make for shallow waters such as the Bahamas for example. Built for long voyages as we have said, the superyacht benefits from interiors offering maximum comforts ranging from the on board cinema to the sauna quarters to the library. 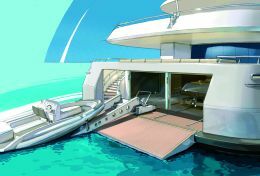 The internal layout guarantees the privacy of the owner and his guests, where the former enjoys a dedicated area on the upper deck, whilst the latter may dispose of six cabins placed between the bridge and the lower deck. Crew's quarters and their dining and entertainment areas are also hosted on the same deck. Built in accordance with Lloyds Register of Shipping and MCA requirements, the Abeking & Rasmussen is equipped with twin Caterpillar engines capable of a declared speed equal to 16.5 knots. Amongst the more interesting 'in house' technical solutions, we note the rather special tender manoeuvring system installed in the stern area, which considerably facilitates the launching and recovery operations of the two crafts. For further information please contact: Abeking & Rasmussen Schiffs-und Yachtwerft GmbH & Co. KG, And der Fähre 2; 27805 Lemwerder; Germany; tel. +49 (0)421 6733-0; fax +49 (0)421 6733-112; web site: www.abeking.com; e-mail info@abeking.com. Beam 12.40 m.- Draught: 3.20 m.
Maximum Declared Speed 16,5 knots. Exterior & Interior Design: Reymond & Langton Design.